IPL 2019: What will KXIP's new star signing Sam Curran bring to the team? Kings XI Punjab went into the momentous IPL Auction with Rs 36.20 crores after having released a total of 11 players. With four slots available for foreign players coupled with a healthy purse, they smashed the bidding charts and snapped up England international Sam Curran for a staggering price of Rs. 7.20 Cr. After already having splashed Rs. 8.4 Cr on mystery spinner Varun Chakaravarthy, the Kings rubbed shoulders with an ambitious Royal Challengers Bangalore, but came out on top due to the opposition's budget. Having said all this about Curran, let's take a look at his roots and what he will bring to KXIP. Born in Northampton to former Zimbabwean cricketer Kevin Curran, the left-arm bowler represented Surrey at the U-15 and U-17 level, before breaking into the second and first team. At a tender age of 17, he made his senior debut against Kent back in 2015 in the shortest format. A few days later, he became Surrey's second youngest first-class cricketer. Promising displays at the domestic level earned him a call-up from Auckland Aces last year. Furthermore, seven wickets in the ICC U-19 World Cup and a fine array of performances for the England Lions won him a first senior call-up last year. 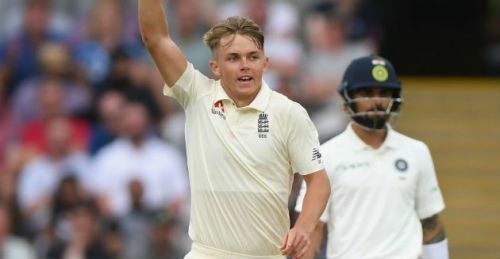 Curran did not feature in any games in the Tri-series against Australia and New Zealand, but made his mark against the best Test team in the world - India. Owing to his burgeoning capability to swing the ball late, land it in the right areas at a considerably good pace and pick up early wickets, the 20-year-old has claimed 14 scalps in the longest version of the game. What can he add to KXIP? Without a doubt, Sam Curran can open the bowling and swing the ball in the first couple of overs. He can also land the yorker, arguably the most lethal weapon in all forms of the gentleman's game. What surprised the entire Indian supporters in the series against the Three Lions earlier this year was the way the southpaw walked into the middle at number 9 and played fearlessly. For KXIP, he will be tasked with finishing the innings with the bat. That's quite an addition to the team, ain't it? How often will he start for KXIP? As of now, it will depend on the number of spinners KXIP will field on a given day. Undoubtedly, Mujeeb Ur Rahman cannot be kept out. The same goes for skipper Ravichandran Ashwin and Andrew Tye, last season's purple cap holder. With the purchase of young Varun Chakaravarthy, it will be interesting to see how the team balance of the Punjab-based side unfolds. Should Mohammad Shami fail to provide the goods, as he hasn't really established himself as a feared fast bowler in the T20 format, Curran might be drafted in with Tye as a second fast bowler. Ankit Rajpoot will be vying for a spot in the side as well. It also depends on the team's start to the season. Thus, we can expect Sam Curran to don the Kings XI Punjab colors on 7-10 occasions.